Get even more mind-expanding power for your keyboard, bass, guitar or vocals with the VIRTUALIZER 3D FX2000 Effects Processor. This amazing rack unit has 71 incredible new algorithms, including true studio-grade stereo and 3D effects that will add a head-spinning new dimension to your sound, both live and in the studio. The FX2000 employs BEHRINGER RSM (Real Sound Modeling) technology to simulate acoustic environments with stunning accuracy. Effects options include powerful modulation, amp simulation, distortion and special effects, as well as effective dynamic and psychoacoustics processing. Performance is further enhanced through user-addressable high and low EQ and wave-adaptive VIRTUAL ROOM reverb algorithms. Because it is one of the most desired effects, the FX2000 provides 12 different reverb programs, so you always have the ideal reverb for your live performance or studio needs. The FX2000 has some of the best-sounding reverb and delay programs, but that’s not all. It also provides excellent modulation effects (such as chorus, flanger and phaser), including special variations like musical pitch shifter, tremolo and even a leslie simulation. The FX2000 is also equipped with distortion, amplifier and speaker simulation including VOCAL DISTORTION, TUBE DISTORTION, GUITAR AMP, TRI FUZZ, SPEAKER SIMULATION, RING MODULATOR and LO-FI. Sometimes you want to add a little (or a lot) of color to your reverb and delay patches. The FX2000 allows you to layer modulation effects like chorus, flanger, pitch or tremolo with your reverb or delay selections. Logical grouping of parameters, along with the combination of encoders, buttons, LEDs and an easily readable LED display, make operating the FX2000 a breeze. You are free to edit up to seven parameters per preset, and then save them for future use in the 100 provided memory locations. With its extremely powerful processing capability and versatile array of features, the FX2000 will become the busiest tool in your audio arsenal. 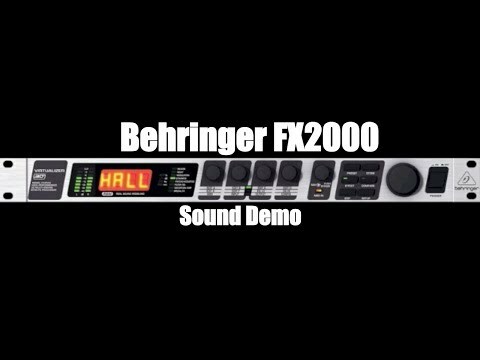 Stop by your BEHRINGER dealer today and find out why more professional sound engineers are turning to the FX2000 as their primary FX processor— both in the studio and on the road.